Successfully Added 17 Inch Touchscreen LCD with VGA to your Shopping Cart. For nearly the same price as a regular monitor, get this amazing 17 Inch Touchscreen LCD with VGA to help increase efficiency and boost productivity of your place of business. 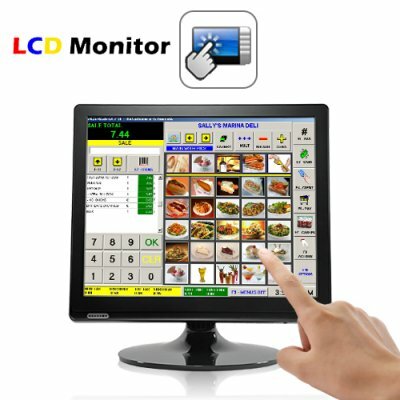 For an all-in-one Point of Sale business solution at an amazing wholesale price, this 17 Inch Touchscreen LCD with VGA is unbeatable! FOR HOME/OFFICE: Touch the screen directly with the pen stylus (included) or your fingers. Why waste time sketching out your ideas on paper and scanning them when you can now sketch right on the screen! Kids will love it too. Open up Microsoft Paint and let them screen finger paint! Great for hours and hours of fun! Here's some great news for multitaskers! Tap and click at the same time. For example, you can finger drag icons around the desktop with your left hand and mouse click open files with your right hand. Instantly double your productivity! FOR BUSINESS: 17 inches of display brilliance is perfect for the home or office PC, but add touchscreen to the deal and this baby transforms into an ideal POS (Point Of Sale) business solution! Here's a question for you restaurant owners out there. Do you recognize these bottlenecks? End the customer experience nightmares with this 17 Inch LCD touchscreen wonder! POS screens aren't just transforming the food and beverage industry (bars, food court shops, coffee and donut stores, etc. ), they're revolutionizing how quickly business is done in the entire retail business realm. Gas and petrol stations with customers lining out the door. Double and triple your volume and keep your customers happy with this touchscreen solution! It's also great for mall booths and kiosks selling everything from lottery tickets to cigarettes! Whether you're in retail sales or provide consulting solutions for the industry, add this point of sales phenomenon to your arsenal to increase sales, improve the customer service experience, and minimize cash transaction losses. Need a smaller, more compact solution, or maybe a larger heavy-duty monitor? Try our identical 15 inch version [CVJU-E38] or 19 inch version [CVJU-E130]!